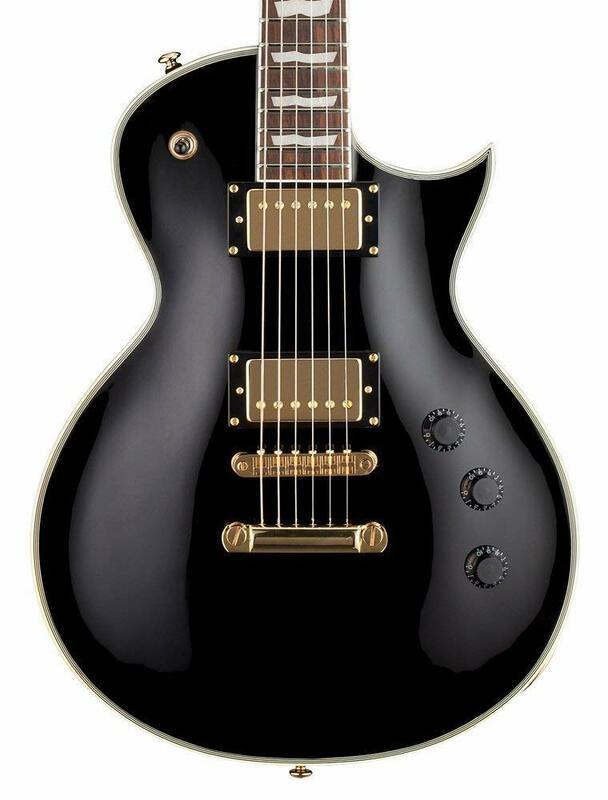 The LTD EC-256 is a classy Les Paul style guitar at an amazing price!! If you love the Les Paul, and let’s face it what’s not to love, then you may like to take a look at the LTD EC-256. We think it is probably one of the classiest Les Paul style guitars on the market at this price point. It is common for the big guitar companies to create an alternative brand through which they launch an entry level range of guitars. Think of Fender with Squire or Gibson with Epiphone. The idea is that by creating an alternative brand you can produce budget guitars, with low cost raw materials but maintain a high level of attention to quality. By doing this you don’t dilute the pedigree of your main brand but can tap into the budget guitar market. To that end LTD is the budget range of guitars designed by ESP Guitars. LTD was founded in 1996 and brings the quality and pedigree of ESP guitars at a more affordable price. What has the LTD EC-256 got to offer? Well as you would expect this is a classic Les Paul guitar but with a few pleasant surprises. The standard Les Paul body is cut from a solid piece of mahogany but this is a more streamlined guitar compared to the typical Les Paul. The body is slimmer and so the guitar is lighter and therefore slightly more comfortable than a standard Les Paul. The neck is a departure from what you would expect from a Les Paul. It is a 3 piece mahogany neck and is topped off with a roasted Jatoba fingerboard. However, the cut of the neck is more slimline with a 350 mm fingerboard radius and a 42 mm nut width. With 22 XJ frets this is a really comfortable neck to play. Whether you are soloing or rocking out a chord progression this neck is comfortable with what ever you chose to throw at it. In terms of build quality the LTD EC-256 is top quality. There is nothing that we can find to fault on this guitar. From the body and neck through to the finish the attention to detail is superb. This is an ESP guitar so you would expect some top class pickups and you won’t be disappointed. The LTD EC-256 comes armed with two ESP designed humbucking pickups. In the bridge position you have a LH150B and the LH150N in the neck position. The pickups can be accessed through the normal three way pickup selector and there is a volume control for each pickup. Unlike the standard Les Paul there is only one tone control but this is a push pull coil split which is a nice feature to have on a guitar fitted with humbuckers. In terms of hardware the LTD EC-256 is finished off with a tune-o-matic bridge and tailpiece and LTD tuners. What is the LTD EC-256 like plugged in? This really is a guitar that can handle just about anything that you would care to throw at it. And this is very true when plugged in. Plugged in and played on a clean tone the LTD EC-256 has a sweet sound. The neck pickup is phenomenally mellow with a beautiful warm tone which will have you smiling. The bridge pickup has a really crisp sound with enough edge to it without sounding cheap and cheerful. However, let’s not forget that this is a rock guitar and so it is an instrument that should come alive when you turn up the gain. Well you won’t be disappointed! Once again I love the neck pickup. With the distortion turned up it has a beautiful warm sound but with a reassuring growl that you can really feel in the pit of your stomach. This is a sound that you would be happy to find on a far more expensive guitar. The bridge pickup has a really tight crunchy sound which will keep even the most die hard metal heads happy. All in all the sound and feel of this guitar is amazing and you would be mistaken in thinking this was a far more expensive guitar. To sum up the LTD EC-256 is an impressive guitar for the money. Ok it is not a bargain basement guitar but if you want a little bit extra for not that much more money then this is the guitar for you. As we said earlier there is not much that we could find that was wrong with the LTD EC-256. The build quality is first class and the playability is brilliant. The pickups are great and give you plenty of options if you want to experiment with your sound. Would we recommend the LTD EC-256? Our answer would be an unreserved yes!